I am a stay-at-home mom. I homeschool my children. We are together all the time. All of these things may lead you to think our family would be very connected, but just being home with each other a lot doesn’t really mean that much. The amount of time we spend together is not enough by itself to constitute a “strong” family. As a young, working woman expecting our first child, I read an article at the OB’s office that talked about the working mom vs. the stay-at-home mom. Something I read in that article has stuck with me ever since. A study quoted in the article found that while stay-at-home moms HAD MORE time with their children, working moms MADE MORE out of the time they did have with their children. Basically, QUANTITY of time vs. QUALITY of time. While encouraging to me at the time as a soon-to-be working mom, I am now very disheartened by that study. And I’m also determined to prove families of all kinds can have QUALITY time, no matter how much or little they are together. You don’t have to have be crafty or have an education degree or even be the most patient parent in the world to bring your family closer together. A willing heart and some daily choices will take you and your kin a long way towards becoming less like random people living under the same roof and more like a team! Every day during the month of October, I will post a simple “family tie.” These “ties” will include strengthening ideas for you, you and your spouse, you and your children, and the whole family! To keep up with this 31 Days series, you can sign up to get each post sent right to your inbox for FREE! I will also link to them at the bottom of this post as they go live! And to check out LOTS and LOTS more 31 Days series, head over to the The Nester’s lovely space to check out the link-up! 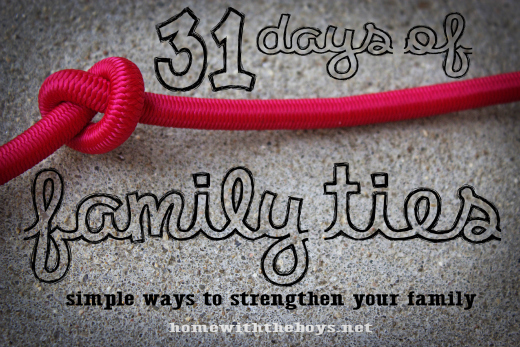 Click here for a free printable list of all 31 Family Ties! Thanks for your enthusiasm, Tracie! Looking forward to your series as well! Hi old friend! Looks like you have a great series too! Hope you are doing well! It’s so true! I’ve been noticing over the years more of a move away from “quality” time to “quantity” time….and we need to come back to the QUALITY AND QUANTITY! Making the best use of our time…but not feeling like we have to engage every.waking.moment either. Looking forward to this series! This will be such a great journey together! Let’s get the quality back! Glad to have you here Emma! Excellent! I also homeschool 🙂 I look forward to this series–it’s so true that it’s not quantity, it’s quality! My series is on being the mom you want to be! I am excited for this challenge! I’m looking forward to reading your series! Now that my children are 7 and 11 I can see the fruits of being intentional about having a strong family. Kids NEED this security when they get to the middle grades! Can’t wait to read more from you, Erin. Thanks for the thoughts! This coincides with some of my family vacation experiences…all the quantity, but sometimes the togetherness breeds more discord!